Motorola recently announced the Moto P30 exclusively in the Chinese market. It is the first smartphone from Motorola which comes with notch display design and iPhone X like a dual camera set up at the back. The Moto P30 is said to be coming to the global market as the Moto One Power. 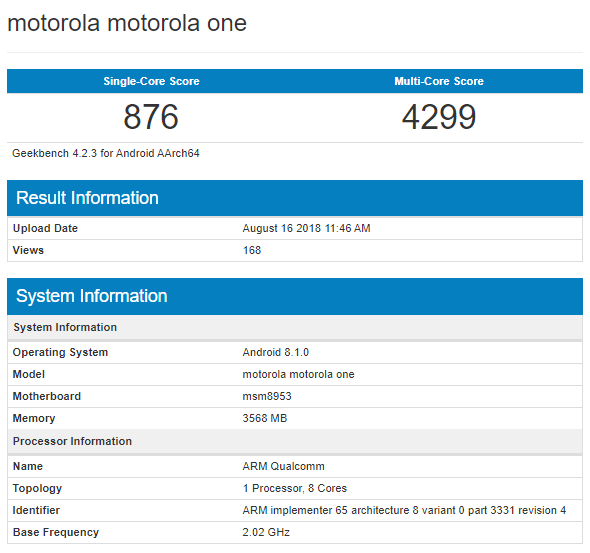 The Moto One Power supposed to be the less powerful smartphone among the two according to the leaks. The smartphone got leaked several times in pictures, but today we got some detailed specifications from the GeekBench leak of the smartphone. The smartphone is going to feature a Qualcomm Snapdragon 625 CPU and 4GB RAM. The Motorola One smartphone variant which was benchmarked was running the Android 8.1 Oreo at the time, but we might get the Android 9 Pie running out of the box in this smartphone. This phone is an Android One powered so even if it will come with Android 8.1 Oreo; it will get the Android 9 Pie soon. The benchmark sheet of the smartphone doesn’t reveal much about the smartphone like the screen size, resolution or camera specifications. So, we have to stick back to the rumors which suggest a 6.2 inches display as in P30. The Motorola P30 launched in China this week, and we might listen about a global release of the Motorola One Power smartphone anytime now.